This salmon dish comes together using only four ingredients! Flavorful, moist, and family approved…..you’ll definitely want to add this to the meal plan! Since living in Seattle, my family and I LOVE eating salmon. My kids can chow down on it and clear their plates in no time!! Since living in Houston, its not as easy to purchase at the stores (we are picky with our quality now), but when we do stock up, I love to try new varieties! 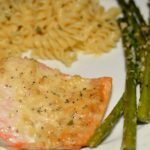 A few weeks ago, I took a few salmon filets out to defrost in the refrigerator only to forget about them and not realize it until just about dinnertime! Being pressed for time, I knew I needed something quick and easy. Since my Melt in Your Mouth Chicken is always such a big hit, I decided to try it using salmon and hope for the best. I whipped up the topping in under five minutes since it only calls for 3 ingredients! I quickly spread it on top of the salmon and once the oven was preheated, I popped the baking tray into the oven and moved on. 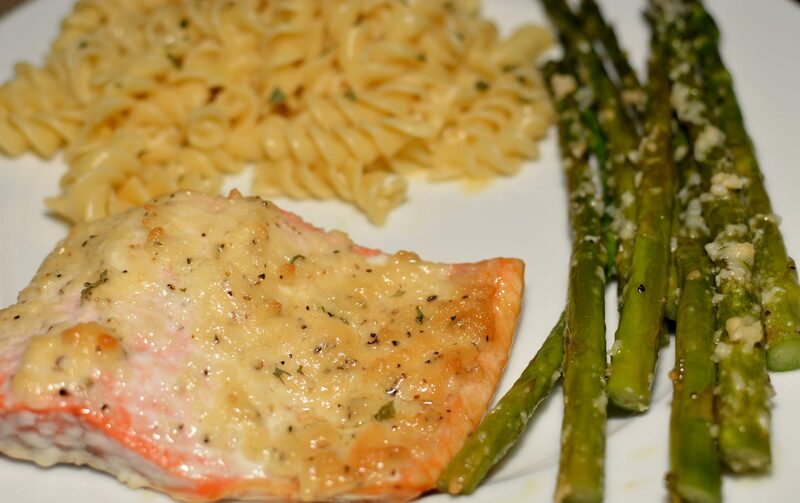 The salmon was incredibly moist/flaky and a huge hit with my family (kids especially). I paired ours with my Garlic and Parmesan Roasted Asparagus and some buttered noodles and called it done! Within twenty minutes, dinner was on the table and ready to devour! All five of us had our plates cleared in no time and I got thumbs up from everyone to add this to our recurring meal list! All in all, this was a great meal for being pressed on time and definitely one I will be making again. For all you salmon/seafood fans, I recommend trying this version as I am sure you too will love it! *I order all my meats in bulk from a company called Zaycon Foods. We recently bought our salmon from them and the quality is fabulous! It comes in vacuum sealed bags making freezing it a breeze! They also sell chicken, beef, shrimp, bacon, etc which we buy too! Check it out here! Using only 4 ingredients, this dish is flavorful, budget friendly, and quick to the table! In a small bowl, combine the mayonnaise, parmesan, and bread crumbs. 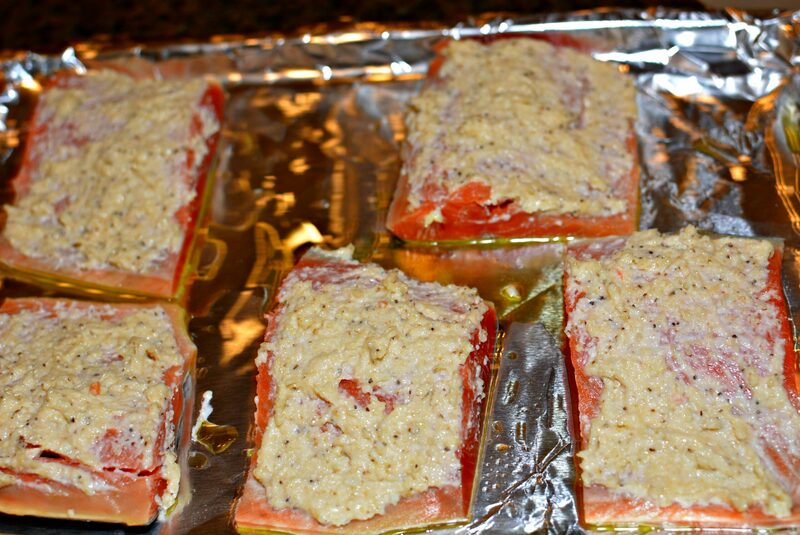 Place the salmon filets on a baking sheet lined with foil (if skin still on, skin side down). Spread mayonnaise mixture evenly on top of each salmon filet, coating evenly. Place baking sheet into preheated oven, 400, and bake for about 15 minutes, or until cooked through. Will this work on pork chops as well? Absolutely! I have only personally tried it on chicken and salmon, however, pork chops would be great with this on them!